The law firm of Weld Riley, S.C. is pleased to announce Attorney Garrett W. Nix has been elected a Shareholder of the firm. “I love being an attorney because we get to help so many people not only with their problems, but also helping them plan for the future. It’s extremely rewarding work,” Nix said. Garrett, a member of the Business section, joined the firm in 2013. His legal practice centers on providing businesses and individuals expert legal counsel on issues relating to business formation, operations, and succession planning. Garrett also assists individuals in developing estate plans which most efficiently achieve each client’s objectives. 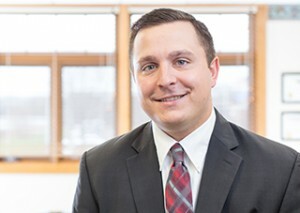 Garrett has a specialty in farm and business succession planning and serves as municipal counsel for several government entities in western Wisconsin. Garrett received his undergraduate degree from the University of Wisconsin-Stevens Point, with a B.S. in Economics and his law degree from Marquette University Law School. While in law school, Garrett provided regulatory compliance analysis while working for a Fortune 500 insurance company. He also interned in the legal department of a large health care provider in western Wisconsin working on issues including risk management, contract review and negotiation, and employment law. He also participated in the Robert F. Wagner National Labor & Employment Law Moot Court Competition. “I’m truly humbled that my colleagues elected me as a Shareholder. I grew up in western Wisconsin and it’s a dream come true to work in this firm and count all of these fantastic attorneys as my colleagues and friends.” Nix added. Since becoming a lawyer in 2012, Garrett has worked with numerous individuals and businesses with planning and transactional matters. Garrett was raised in rural Osseo, Wisconsin and currently lives in Osseo with his wife. Weld Riley, S.C. was formed in 1991 and is comprised of Litigation, Labor and Employment, Business, Estate Planning, Real Estate, and Government Relations Sections. The firm employs 76 people in its Eau Claire, Menomonie and Black River Falls offices.